Founded in 1836, the Huddersfield Choral Society has developed an international reputation as one of the UK's leading choral societies, performing with some of the best orchestras, soloists and conductors in the country. The Huddersfield Choral Society was established by sixteen local musicians, and recruited its members mainly from the mixed choirs of nonconformist churches. The choir is particularly well known for its performances of Handel’s Messiah. The original society of around seventy singers and instrumentalists met monthly for rehearsals and gave quarterly performances for friends and subscribers. It started employing the services of professional orchestras on a regular basis in 1942 and has collaborated with many prominent orchestras ever since, including the BBC Philharmonic, Royal Liverpool Philharmonic Orchestra, Royal Northern Sinfonia and the Orchestra of Opera North. Today’s choir consists of almost 200 singers and enjoys a wide repertoire in which oratorio and other sacred music sits alongside concert opera and contemporary compositions. Under distinguished Principal Conductors including Sir Malcolm Sargent, Dr. Jane Glover and Martyn Brabbins, and renowned choir trainers such as Herbert Bardgett, Douglas Robinson and Brian Kay, the choir has developed an international reputation for all that is best in the British tradition of amateur choral singing, and continues to receive wide praise for its performances both nationally and abroad. Guest conductors have included Yan Pascal Tortelier, Harry Christophers, Sir Mark Elder, Sir Charles Mackerras, Odaline de la Martinez, Vernon Handley and Vasily Petrenko. 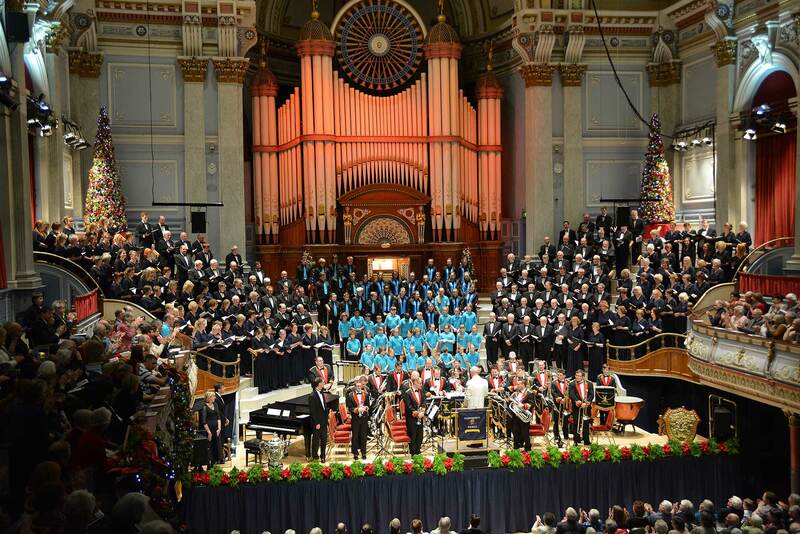 In addition to its concerts in the Huddersfield Town Hall, the Choral Society has regularly performed in London since its first visit in 1887, taking part in the 1951 Festival of Britain celebrations in the Royal Festival Hall, Shakespeare’s Birthday Concert in 1975, and more recently participating in the Desert Island Discs 70th anniversary Prom in the Royal Albert Hall. Since its first overseas tour to the Netherlands in 1928, the Choral Society has performed to acclaim in many of the world’s great musical cities, including Vienna, Berlin, Munich, Boston, Amsterdam, Brussels, Bratislava, Brno, Antwerp, Porto, Osaka and Reims, and are to travel to Canada in 2017. Highlights in recent years have included a performance to mark the 150th anniversary of Mendelssohn’s Elijah, concerts during the opening season of Manchester’s Bridgewater Hall, operatic galas with José Carreras and Dame Kiri Te Kanawa, Classical Spectaculars at Huddersfield’s John Smith’s Stadium and Newcastle Arena, ‘Proms in The Park’ and singing for the Queen. The Choral Society’s reputation is known beyond the concert hall through its many recordings and broadcasts including Handel’s Messiah, Elgar’s The Dream of Gerontius, a compilation of choral and orchestral favourites on the CD entitled Brian Kay’s Sunday Morning and a number of Christmas Carol albums. The Youth Choirs can be heard on the Choral’s The Hymns Album. Since the foundation of the Youth Choir and Children’s Choir (also previously known as the ‘Junior Choirs’, and now the ‘Youth Choirs’) the Choral Society has worked to engage with its younger members, inviting the Youth Choirs to take part in a performance of Benjamin Britten’s Rejoice in the Lamb under musical director Martyn Brabbins, and welcoming young people to perform solos at the Choral’s annual ‘picnic’. Members of the Youth Choirs are regularly invited to hear the Choral Society perform a wide range of repertoire at various concerts throughout the year, earning their ticket by selling programmes to both public and subscriber audiences. The Youth Choirs have also contributed many energetic and enthusiastic performances alongside the senior choir in Christmas concerts over the years. The Huddersfield Choral Society and its Youth Choirs have proudly represented the strong musical heritage of the area for 180 years, and look forward to continuing to cultivate musical excellence for many more. Concerts and recordings are broadcast regularly on Classic FM and on BBC Radio. 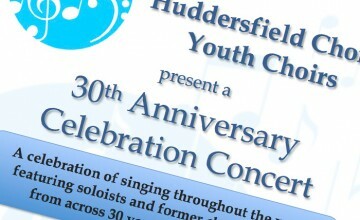 Both the Huddersfield Choral Society and its Youth Choirs have also performed on Songs of Praise on numerous occasions.